This isn't where you'd expect to find a forest, but then again this isn't the forest you'd expect to find. The forest made perfect sense, once, when this land was located elsewhere. Go back 225 million years and this land was situated near the Pangaean equator. The humid climate helped trees to thrive and the ancient forest grew well in the damp environment. Seeds found favorable spots in the soil, trunks surged upwards, leaves and needles caught the sunlight, and then the trees fell. Death brought some of them down to the river where they were entombed by sediment and ash. Packed neatly in an anaerobic coffin, the trees were subjected to a new process in the afterlife. Instead of decomposing in the traditional fashion, their silent cells became the mold for minerals that would long outlast them. Lignin and cellulose gave way to quartz, iron, and manganese as wood gave way to stone. The organic materials that once comprised a living tree vanished, but an echo of their form was left behind in the rock that took their place. The forest was petrified, buried underground. 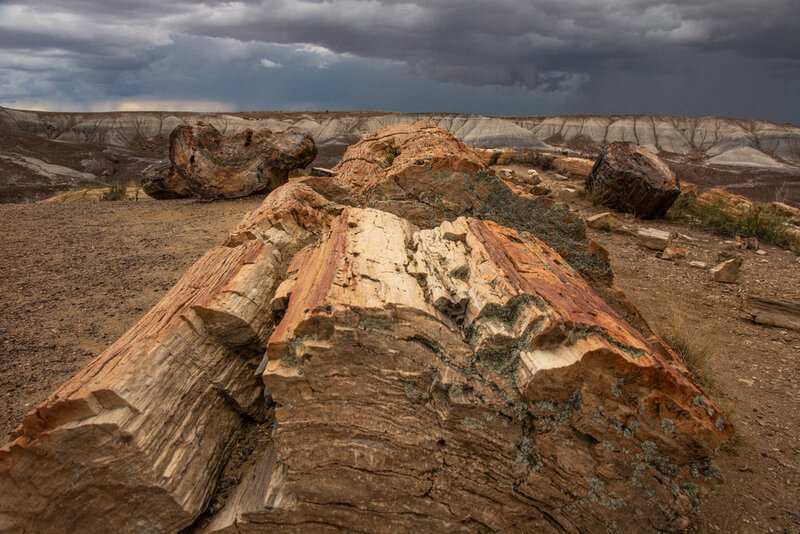 As the eons passed, the supercontinent broke apart, this land drifted north to a drier place, and the layers of earth that covered the stony logs were slowly swept away by water and wind til the fallen trees lay exposed beneath the Arizona sky. That sky is threatening rain right now. Dark clouds build in the southwest and the wind gusts over the badlands. We walk on, making our way through the Crystal Forest. Petrified wood is abundant along this trail. Chunks of logs that look like they were cut with a saw are strewn across the landscape. On the outside, some could still be mistaken for living trees. The colors are close enough to merit a second glance. Reds and browns and tans make for a convincing replica of bark or recently felled timber. Lichens grow in the crevices, adding to the realism. But fractures in these rocks reveal their inner, truer character, providing cross-sectional views of the crystals that replaced the heartwood. Purple is a common color here, along with pearlescent whites and grays and silvers. In some instances, I could sit and count the growth rings with moderate accuracy. In others, I can only admire the profusion of quartz that has brilliantly filled the place where living cells once did their work. A raven perches on a piece of petrified wood, turning its head towards the approaching storm. What avian ancestor saw this tree when it was upright and alive? It was no bird, at least not as we know them now. The earliest bird-like organisms we are currently aware of date back just 170 million years to the Jurassic, falling 55 million years short of the estimated age of this stony woodland. This tree's life unfolded before the time of most of the more well-known dinosaurs. Indeed, we in the present live closer in time to Tyrannosaurus rex than these trees did. Time is the author of this place. It has taken a staggering amount of time for this to come to be. Life had to lead to the trees which had to die and come to rest very specifically so that minerals could painstakingly recreate them. Then the Colorado Plateau had to rise and succumb to erosive forces that would expose these fossils so that one day another product of life, humans, could inhabit the land alongside them. For at least 13,000 years there have been people here, more recently represented by the Puerco Puebloans, the Spanish colonists, the railroad barons, and the National Park Service. All this time has elapsed, and yet I would wager that most visitors spend nowhere near enough time here to truly understand it. I know we are falling regrettably into that trap right now. This park is relatively small in area, has a handful of shorter trails, and is well developed for a drive-through visit. We, like so many others, are voyagers on I-40, the highway that cuts the park in two. It is on the way, an easy detour, but it should be more of a destination. A few hours are not sufficient to see the work of a quarter billion years. More time is required. There is backcountry here! There is arid grassland wilderness that rolls over the badlands to rocky groves that roads do not approach. There are lizards and snakes, squirrels and deer, pronghorn and coyotes, foxes and cottontails out in the washes. There are starry nights and ominous storms like the one that continues to draw ever nearer in the diminishing distance. How do the colors change in the rain? What do the crystals look like in the light of the full moon? If seeing is the only goal, a few hours will suffice. If knowing is the aim, then more time is required. Today we are seeing, constrained by time and a destination in the east. That's okay, for now. I'll just hold in my mind a dream of a backpack, a map, and time enough to explore time's creation.